New pictures of puppies in photo album of litter "E". 8. 1. 2018 Puppies are 14 days old so we dewormed them for the first time. New video HERE. 25. 12. 2017 Beauceron litter "E" Carský klenot was born. More info HERE. 23. 10. 2017 We have mated! If everything goes well, we expect the birth of beaucerons litter "E" Carský klenot around Christmas. The father is massive and balanced Diego z Ajysyt and mother is our multichampion female Cadence Carský klenot. More information soon. 15. 10. 2017 Our german shepherd Boss z Bukovanské osady fulfilled breed test in Pohořelice u Brna with breeding code 5QV1/P a 1st breeding class today! 25. 12. 2016 Puppies are 3 weeks old today. New photos in section "Actual litter". 14. 12. 2016 Litter "B" Carský klenot celebrates 4th birthday today. We wish for Bridgette, Belladona, Basil, Basque and Bergen a lot of joy, contentment and good health!!! 1. 11. 2016 Pregnancy confirmed! In early December it would be born beauceron "D" litter. In puppies, we expect a balanced character, excellent exterior and great potential for training, herding and other activities. Supposed taking at the beginning of February 2017. We accept bookings for puppies now. 4. 10. 2016 We have mated! Cadence Carský klenot was mated with beautiful and handy black and tan beauceron named Esmian le Coeur Pur. We expect birth of puppies at the start of December. We accept reservations. 15. 2. 2016 JCH Bystraja Jaroslawna was mated by dog Donel Wicari. If everything goes well, we expect birth of small borzoi in mid April. More information HERE. 10. 2. 2016 Our "beauceron puppies" from litter "C" Carský klenot (Kerang Warrior Soul x Bellissimé z Dorky) celebrate 2nd birthday today. We wish all the best not only to our Cadence, but also to Carmina, Céleste, Clémentine, Cadet, Caleb and Corbin! And Bellissimé z Dorky passed her 28th exam StPr1 with full 100 points! 20. 10. 2015 Bellissimé z Dorky recieved as only one beauceron in CZ the title "Czech champion of work"!!! 19. 10. 2015 Bellissimé z Dorky ended her competition career by winning the category FH2 at World Championship of french shepherd dogs - CMBF 2015, which was held on 16. - 18. 10. 2015 in Třeboň. She sniffed here 96 points and title CACT! 4. 10. 2015 Cadet Carský klenot passed exam HWT and Bergen Carský klenot passed exam ZZO. Big congrats to both owners of our offspring and thanks for presentation! 27. 9. 2015 Bellissimé z Dorky at Qualification for CZ Tracking championship by IPO-FH in Domažlice 26. - 27. 9. 2015 emplaced at third place and with 95/89 - 184 points obtained title CACT! 14. 9. 2015 Bellissimé z Dorky at MSKS Tracking Championship by IPO-FH in Jihlava 12. - 13. 9. 2015 won the first place! 97/78 - 175 points. 1. 9. 2015 We recieved great news from Hungary - Cadet Carský klenot HD A/A ED 0/0!!! Big congrats to his owner! 4. 6. 2015 Cadence Carský klenot (Kerang Warrior Soul x Bellissimé z Dorky) was awarded title CZECH JUNIOR CHAMPION at the age of 15 months! 23. 5. 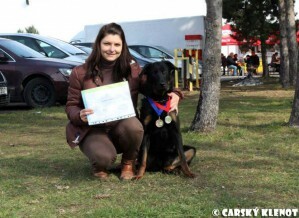 2015 Cadence Carský klenot at International dog show in Litoměřice - V1, CAC, CACIB, BOB!!! 13.5. 2015 My lovely Bellissimé z Dorky celebrates 9th birthday today. I wish you Bellinka many years in good health and vitality like you have now! 3. 5. 2015 Devil Red Vixen passed exam IPO2 - 91/92/91 - 274 points! 2. 5. 2015 Cadence Carský klenot at Dog Expo show Prague - V1, CAJC, Best junior. She fulfilled conditions of Czech Junior champion! 26. 4. 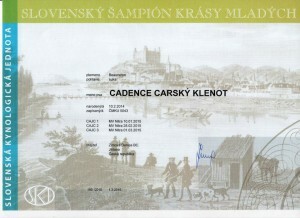 2015 Basil Carský klenot (own. Radmila Painterová) today passed exam BH - 52 points! 12. 4. 2015 During last weekend (11. -12. 4.) Bellissimé z Dorky passed her 27th exam - IPO-FH - 90 + 95 totally 185 points and result Very good. 13. 3. 2015 Amazing message! Cadence Carský klenot - results of X-ray examination: HD A/A, ED 0/0, Spondylosis no signs, Osteochondrosis not afflicted! 2. 3. 2015 Cadence Carský klenot (Kerang Warrior Soul x Bellissimé z Dorky) at IDS DUO CACIB Nitra in young class 2 x EXC.1, CAJC and awarded title Slovak Junior Champion of Beauty in the age of 12 months! 17. 2. 2015 Super message from Russia! Our offspring Bridgette Carský klenot (Cazan Els Pastors de la Sandra x Bellissimé z Dorky) awarded the title Best female, BOB, Russian champion! 13. 2. 2015 Cadet Carský klenot (Kerang Warrior Soul x Bellissimé z Dorky) in IDS Budapest in young class EXC.1, HPJ, BOJ, BOB!!! 10. 2. 2015 Puppies from our litter "C" Carský klenot (Kerang Warrior Soul x Bellissimé z Dorky) celebrates his first birthday! We wish them all much health, love from their owners and still full bowl of the best canine goodies! 1. 2. 2015 Today celebrates his sixth birthday our first litter "A" (Czech z Lhotecké linie x Bellissimé z Dorky). We wish them a lot more years of life in good health and happiness! 10. 1. 2015 IDS Nitra New Year Show- Cadence Carský klenot - V1, CAJC, Devil Red Vixen - V1, CAC, CACIB, BOS + fulfilled conditions of Slovak champion of beauty!!! 3. 1. 2015 - Cadence Carský klenot at X. Hanácká National Dog Show in Brno in young class title got EXC.1, CAJC, BOJ, BOS! 14. 12. 2014 - Litter "B" Carský klenot (Cazan Els Pastors de la Sandra x Bellissimé z Dorky) celebrates his second birthday today. Happy birthday and make to your owners only joy!!! 29. 11. 2014 - IDS Nitra (SK) - Cadence Carský klenot - young class Exc.2, Devil Red Vixen - working class - Exc.1, CAC, CACIB, BOS!